For a nation our size, Australia is well served with think-tanks and related internet sites evaluating and advocating policy from a range of different perspectives. Whether the IPA, Centre for Independent Studies, Quadrant Online, the Evatt Foundation, the Australia Institute or the more recent Grattan Institute, the ground appears to be covered. So, why establish another conservative minded, internet based think-tank? Especially difficult in a time of financial crisis and its hard to get funding, when ALP governments are on the ascendency across Australia and, compared to overseas, the appetite for forceful, independent debate is less than robust. One reason is that the Cultural-left is dominant in areas like the ABC, the Fairfax Press, most of our universities and amongst our so-called public intellectuals. Listen to the news, read the papers or follow public debates and it soon becomes obvious that the consensus on most issues champions a Cultural-left perspective. With the exception of the Murdoch Press, especially The Australian and commentators like Andrew Bolt, conservative authors and commentators like myself find it impossible to get an airing and, if we do, it is generally as the token spokesman from the ‘right’ selected to balance the other 2 or 3 hand chosen from the ‘left’. The second reason is that the majority of Australian think-tanks are left-of-centre and have strong ties to that side of politics. Take the recently established Grattan Institute. With $15 million provided by the federal ALP and another $15 million by Victoria’s ALP Government, it’s clear that any claim to independence has to be taken sceptically. After all, he who pays the piper, calls the tune. The new technology offers a relatively inexpensive, effective and easy to manage way of communicating ideas, fostering debate and presenting alternative viewpoints. 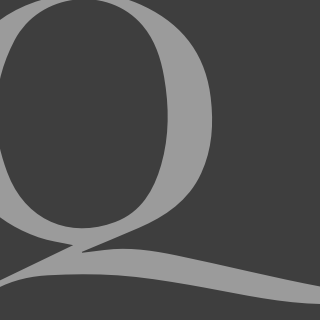 A conservatively minded, internet site is especially needed in the area of education. As I detailed in Dumbing Down, education in Australia, similar to the U.S. and England, has long since been captured by the Cultural-left and those committed to using schools as an instrument to enforce an ideologically driven, politically correct view of the world and contemporary issues. Whether multiculturalism, the environment, gender and gay rights, the class war or indigenous issues, the curriculum and teacher training are now an exercise in group-think and those students or teachers wanting to present a contrary view have little chance of success. With the election of the Rudd Commonwealth Government, and the fact that ALP Governments are in control everywhere except Western Australia, the need for a new education think-tank is especially critical. Control over schools, government and non-government, is now being exerted by ALP dominated groups like the Council of Australian Governments and the Ministerial Council on Education, Employment, Training and Youth Affairs. Both COAG and MCEETYA over the last 2 years have signed off on a raft of national partnership agreements and polices, including: a national curriculum, national testing and school accountability, national teacher registration and certification, a national approach to the early years and specific programs to address the needs of so-called victim groups. Under Chairman Rudd, all roads lead to Canberra and all schools, including non-government schools, are being forced into a regimented, inflexible and state mandated system of management and control. School funding is now tied to implementation and any school that refuses to do the government’s bidding will suffer financially. 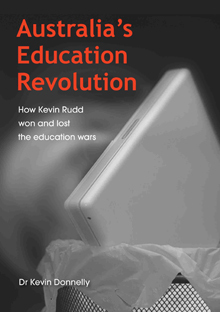 As outlined in my most recent book, Australia’s Education Revolution: How Kevin Rudd Won and Lost the Education Wars, during the last federal election Kevin Rudd promised an education revolution. Based on the last two years, it is obvious that the so-called revolution is more about spin than substance and the record of implementation is abysmal. The computers in schools program is millions of dollars over budget, with principals and teachers complaining of having to meet on-costs and lack of professional development. The school infrastructure program has been so poorly handled that the Commonwealth Auditor-General has launched an inquiry. The very professional associations, groups and education bureaucrats responsible for the current parlous state of Australian education are developing the national curriculum and classroom teachers are leaving the profession in droves because of stress and poor morale. The imperative, especially given the 2010 review of the way non-government schools are funded (the current SES model is condemned by non-government school critics like the Australian Education Union), and the way the curriculum continues to be subverted and dumbed down, is to argue the case for school choice and a liberal view of education. Hence, the reason for establishing the Education Standards Institute (ESI) think-tank and publishing Australia’s Education Revolution – in opposition to a statist, one-size-fits all approach to education, both advocate standards, equity, diversity and choice. Whether introducing vouchers (or tax credits) to enable more parents to choose Catholic and independent schools, establishing community schools free from government control (known as charter schools in the U.S.) or allowing schools to develop an alternative to a state mandated curriculum, there is an alternative. Let the debate begin.